• How to incorporate nutritional management into lifestyle (weight loss and maintenance). • Understanding diabetes and treatment. • How medications help your body control blood sugar and body’s reaction to medications. 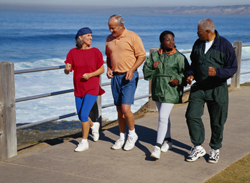 • Incorporating physical activity into lifestyle. • The importance of monitoring blood levels (sugar, cholesterol, A1c), interpreting and using results. • Preventing, detecting and treating acute and chronic complications. • Developing personal strategies to promote and maintain health and behavior changes. Having prediabetes is when your blood sugar level is higher than normal, but not high enough to be diagnosed with type 2 diabetes. 9 out of 10 Americans do not know they have prediabetes. Although, the risk to develop diabetes is higher, it does not mean you will be. Cut your risk. If you have prediabetes and don’t lose weight or increase your physical activity, you could develop type 2 diabetes within five years. loss of toes, feet or legs. There is a proven lifestyle change program that can help you prevent or delay getting type 2 diabetes—the National Diabetes Prevention Program (National DPP). It will help you lower your risk by teaching you how to improve your food choices and increase your physical activity.